Monique Grant is a small-time reporter at a magazine, so she is shocked when infamous actress Evelyn Hugo says she will give an interview only to her. Monique goes to the interview and is informed that Evelyn will tell her everything about her life, but she can't ask why Evelyn has chosen her. 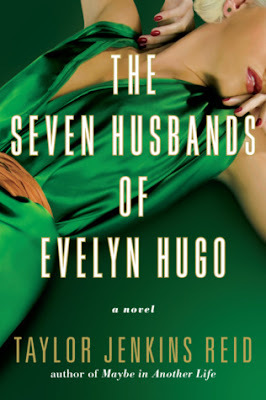 Evelyn starts at the beginning of her life and reveals her rough childhood, her calculated ascension to stardom, and her marriages to seven different husbands. As she talks through her life, Monique will come face-to-face with the devastating truth that her life and Evelyn's are forever intertwined. Taylor Jenkins Reid does a wonderful job of showing the reality behind the scenes of Hollywood and just how steep the cost of fame can be. This book clocks in at 400 pages, but it moves fast. Evelyn's story is a fascinating one, although it is probably familiar to many actresses of the era. She recounts being a young woman desperate to break away from her poor neighborhood and abusive father. But Hollywood of the 1950s demands certain things from its starlets--an appearance of purity and goodness from the slender, blonde, white women who light up the screen. Evelyn dyes her hair, disavows her Cuban heritage, and begins a string of relationships carefully calculated to turn her into American's sweetheart. Evelyn's story by itself would be compelling, but it becomes a book that you can't put down because you desperately want to know what happened to the people in Evelyn's life and to find out why she chose Monique to reveal her life story. I understand why The Seven Husbands of Evelyn Hugo is one of the most popular books of 2017; Taylor Jenkins Reid has so thoroughly transported you into the glamour and pain of Evelyn's life that you won't want to leave until you turn the last page.